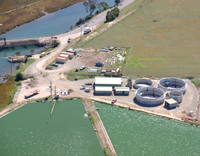 effluent quality to the MBR system and lower cost of ownership. The multi-barrier membrane system integrates biological treatment, cloth media filtration and microfiltration into a single process with resulting savings in membrane area of greater than 50% compared to a typical MBR configuration. The plant is designed to treat an average flow of 0.4 million gallons per day (mgd) of domestic sewage from the local community. In addition to the savings in lifecycle cost, the multi-barrier process provides flexibility and ease of operation. These are the main reasons why this process was selected over MBR. Operators take advantage of this flexibility, especially since St. Helens is a coastal holiday destination, and the population typically increases by up to 50% for a two-month period in summer. 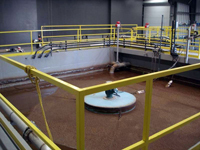 The Aqua-Aerobic® MBR Membrane Biological Reactor (MBR) is the wastewater treatment system of choice for the Quechan Paradise Casino. This newly constructed gaming facility, located on Native American owned land in Winterhaven, California, began its treatment operations in January 2009. Early into the project development, it was decided that the Aqua-Aerobic® MBR system was the optimum solution due to its small footprint, high-quality effluent and low energy consumption. The plant is designed to meet California's strict Title 22 reuse requirements in which effluent is reclaimed to supply drip irrigation for the casino's landscaping and a future onsite golf course. Aqua-Aerobic Systems (AAS), in partnership with the Colorado School of Mines (CSM), has completed the successful startup of a sequencing batch reactor-membrane bioreactor (SBR-MBR). The package system treats domestic wastewater generated by a 400-apartment, student and faculty housing-complex located on the CSM campus in Golden, CO. This success is rooted in a 15-year development program that follows an information Stage-Gate® process.